Area 3 is herding on the coastline. I would take the opportunity to make this the herding of some crazy fantasy animal, like chocobos that eat like sandpipers, but there's probably a more mundane approach, goats or something. Huh, I believe it's supposed to be Augsburg. I've updated the map with larger names, hopefully that'll make it easier to read. I guess CC3 automatically clears the image, because when I zoom in that everything is perfectly legible. Let me know if it's any clearer. 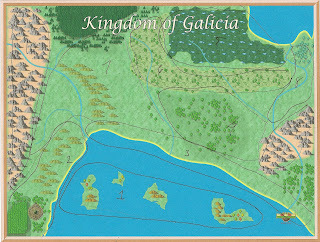 If Galicia is name of the setting, then "Some Fantasy Pittsburgh" should be the name of the campaign.